Happy Friday and happy Blog Hop too! Today marks the start of the February Blog Hop at From the Heart Stamps which will end on Monday. We have a Project 100 Snowmen Theme this month – you can find out more about it HERE. Our designers are showcasing lots of fantastic snowy creations for your inspiration! As you hop along, please leave a comment on each blog. One random commenter will be selected on each blog to win an image of choice from the FTHS store – hurrah! I also used papers by American Crafts called Merry Mint, Marianne Snowflake dies, WRMK Corner Chomper, Spellbinders Banner Die, Papermania Sparkle Dome Stickers and Spectrum Noirs to colour. Now head over to the wonderful Kathy Curry to see what she has created for you 🙂 The hop will end on Monday February 8th at 6 am EST. Winners will be posted on the From the Heart Stamps Blog on Wednesday February 10th. Remember to leave a comment on each of the designers blog to be in with a chance to win an image of your choice from the STORE! Gorgeous card. Love how you have cut the snowflake out of dp. Such a happy card with all the bright colors. Great card Karen. Love the colors you’ve chosen and the snowflake embellishments. This is such a great image. Also, thanks for all your kind words. You do really make me smile with your comments. Your card made me smile to, what a wonderfull card you have made. LOVE this! it makes me smile too 🙂 <<< see? What a fun, bright and cheery card! Fun and happy card for grandkids, so cute! This is so sweet, Karen! They do make you smile (my kids are currently outside trying to make multiple snowpeople on their snow day!). I LOVE all the white on the card, and then all the bright colors you added with your coloring. This is so cute! And the sentiment in red is perfect!! And the dots on the snowflake die cuts paper and green paper make it feel like snow! Wow, so pretty Karen. Love the crisp look of your design and also the way you’ve personalized it for grandkids. Great card. Aww, so sweet. Really cute. These fun snowmens are one of my favorites because they are looking so happy ! Great coloring, Karen and i like the CAS look. I agree, this really made me smile! Fun colors & design, Karen. This is such a wonderful, cheerful card! Your grandkids will love it! This is super cute! Perfect image for a grandkids card! Another one on my wishlist! What a happy trio – love how you designed it and the cute little greetings tag! What a FABulous trio these Snowmen are! Love your design. Your colours are Wonderful. Love the shape of the sentiment too. Super cute card with the adorable snowmen!!! This will bring some big smiles to your grandkids. Love the design and the coloring. Thanks for the inspiration! Love the colors you chose. Such a cheerful card that just makes you smile. oh such a fun card Karen. Puts a smile on my face. This is just so happy and bright! I love this image and have it printed (somewhere on this messy desk) and ready to color so thanks for the inspiration! Hi, this is such cute, playful card! These colors go perfect with the image. Thanks for sharing. another Christmas card with orange on it….love it! Wonder if that will be the Christmas color this year! This image makes me smile too! Great image for grandkids! Your cheerful colors work perfectly with the cheerful image — orange is a fun, unexpected choice. What a sweet and cheerful card. TFS – Love it! What a happy card. Loved it. This is so adorable! I love your colouring! This is a fun blog hop! I’ve been collecting a few of Faith’s snowmen myself – thank you for the inspiration! Hi Karen! Love your card! That pop of color on the scarf is so nice in contrast to all the white. Perfect setting for this cute little guys! Great card. Love the happy snowmen. These snowmen just make me smile too! Super cute card and design!! What a sweet card to send to your grandchildren! Such a sweet card, Karen! I’m hoping to find time to get into the whole hop before it’s over! 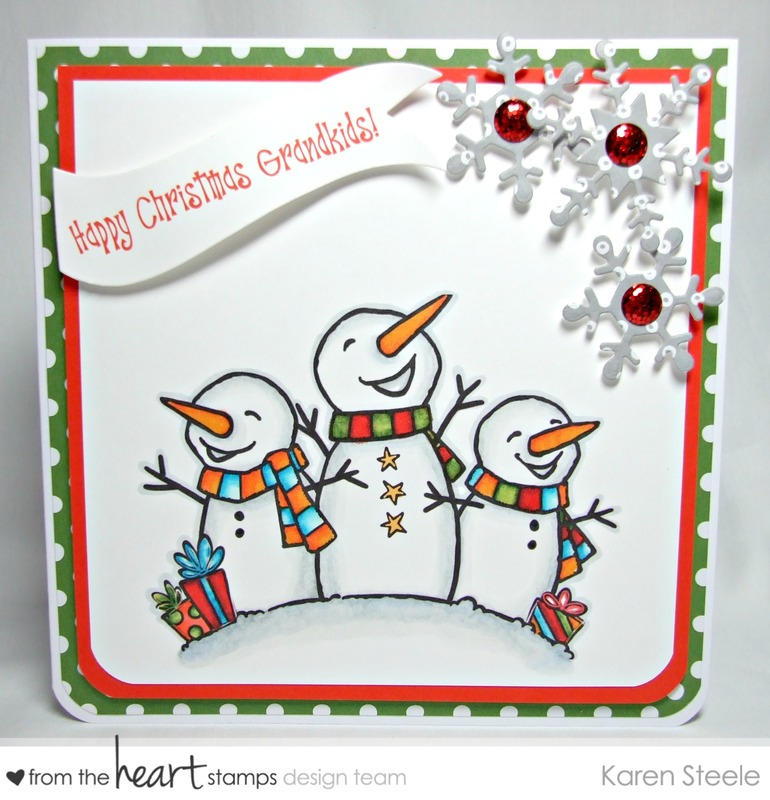 Adorable card…those snowmen made me smile! Fabulous coloring and I love the added snowflakes! Adore this card. So cheery and made me smile as soon as I saw it. What an adorable card Karen! Fun card!! Love the trio, layout, coloring, and papers! !